The Palawan bearded pig was originally described as a subspecies of the bearded pig (Sus barbatus). Physical differences, as well as genetic evidence, led to its recognition as a distinct species in 2005. The Palawan bearded pig is the largest wild pig in the Philippines, although it is markedly smaller than the closely-related bearded pig (Sus barbatus) from Indonesia. The body is dark gray to black in color, with the neck, trunk and limbs all covered in somewhat sparse black hair. A mane of longer pale-tipped hairs extends along the centre of the back; this is most prominent on the back of the head and neck. The tail is covered with long, black hair, and has a distinct feather-like "brush" of long hair at the tip. The long, narrow head ends with a nasal disc. This species does not develop facial warts (protuberances), but contrasting areas of color on the face impart a masked appearance. The forehead, end of snout, and around the eyes are black, while a band of longer whitish or ochre hairs crosses the bridge of the nose in front of the eyes and widens as it follows the jawline. This namesake "beard" is longest on the jowls; a tuft of pale hair is also present in front of each eye. The Palawan bearded pig can be differentiated from the larger bearded pig (Sus barbatus) on the basis of range, skull and body size, and facial markings. While the bearded pig's beard tends to be most prominent betwen the eyes and snout, the hairs in the same area are quite short in the Palawan bearded pig, with the longest hairs occuring along the jawline. Very little is known about the reproductive habits of the Palawan bearded pig, although they are likely very similar to those of the bearded pig (Sus barbatus). At birth, the young are marked with pale orange stripes, similar to other pigs. The Palawan bearded pig has not been well-studied, and much of what is known comes from anecdotal reports. The species is primarily nocturnal in nature, although this activity pattern may be influenced by intensive hunting - reports suggest that before heavy paching began, these pigs could be seen in open grassland habitats throughout the day, except during the hottest hours. During the day, the Palawan bearded pig seeks out resting places in forest, digging shallow depressions in sheltered areas. Foraging occurs in most native forest types, wetlands, and occasionally in grasslands. As the forests on Palawan become increasingly fragmented, cultivated areas represent a significant food source for this species - Palawan bearded pigs can be very destructive to crops. The most common field signs are ruts created by rooting in the soil with the snout. The species has been observed swimming between islands, and mud wallows are regularly used. Family group: Small groups of 2-3 individuals reported. Diet: Likely omnivorous. Fallen fruits (especies from Ficus trees), as well as crops (corn, camote, ube, gabi, rice) have been recorded in the diet. Earthworms and arthropods within the soil may be consumed. Main Predators: Few surviving, save for pythons. Feral dogs and humans constitute the biggest threat. 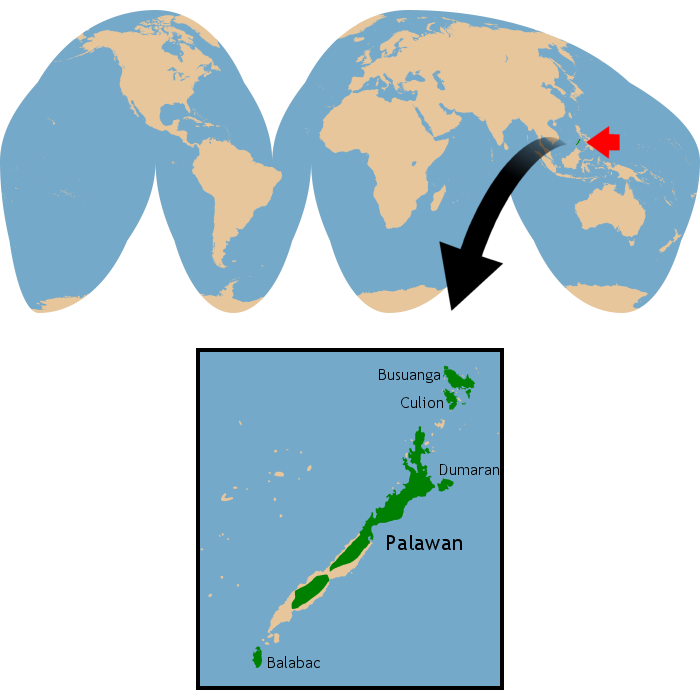 Endemic to ten islands in the Palawan faunal region of the Philippines, including Palawan itself, Balabac, Bugsuk, Busuanga, Calauit, Coron, Culion, Dumaran, Linapacan, and Pandanan. This species is a forest generalist, and inhabits all major forest types (both primary/old growth and secondary forests) from sea level to 1,500 m. It was also formerly common in forest-grassland mosaics in Calauit. The approximate range is depicted in the map below. IUCN Red List: Near Threatened (2017). CITES Listing: Not listed (2017). Threats: Hunting, habitat destruction due to logging, agriculture, and urban development. There have been no recent estimates of population size, although the Palawan bearded pig appears to be locally common in some areas of its patchy distribution. The overall population trend is declining.